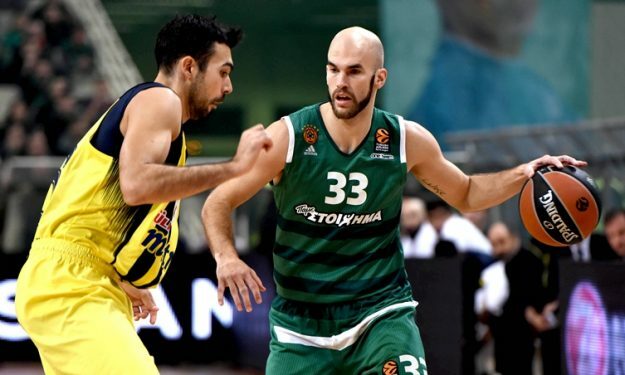 Kostas Sloukas returns to his official blog on Eurohoops.net right before the jump ball of the big series between Fenerbahce and Panathinaikos! He writes about the difficult period of his injury and the first operation of his professional career, about the responsibility he and his team have, and about all those things he believes are going to decide the battle between two very powerful rivals, who have all the… motivation in the world to reach the Final Four in Istanbul! Hello to everyone! I’m in Istanbul and we’re preparing for the Playoffs and the difficult series that awaits us against Panathinaikos. First of all, I would like to thank everyone for all the messages they send me and for their support. And also, Fener’s management, my coaches and my teammates, who have been beside me all this time and helped me with their positive attitude. It was the toughest month of my career. When I found out I had to go in surgery, honestly, I went weak at the knees. It was unexpected. I was in pain, but I kept on playing and trying to give my best in every game. After a certain point we understood that I couldn’t go on like that. I found out that I had to undergo surgery and I went into the operating room the next day… I also want to thank the doctors and all those that helped me get well and have a fast recovery. Whether we deserved the home court advantage or not, I can’t say. We could’ve gotten it. That didn’t happen and now we look ahead. We were affected by injuries, the Turkish league – which is very competitive, but we didn’t play as expected and as we should have. We had defeats that we should have avoided and this is kind of how we found ourselves without the home court advantage in the Playoffs. The season is just getting started for Fenerbahce and for all the big teams in the EuroLeague. The most important games are now. Our opponent has one of the toughest and strong home courts in Europe. They’ve only been beaten once in the Olympic Sports Center in Athens, by Olympiacos, and this shows the strength of their home court. Their fans create a great atmosphere for their team and it’s difficult for any opponent not to be affected. We have to do the best we can and give everything we’ve got. The first batch of the series is 80 minutes in Athens. I have faith in my team and it’s very important for us that we’re going to play with a full roster. We’re only looking at the first game at this point. A lot will be decided from who is going to be more ready, mentally and physically. Whoever executes their coach’s plan better and more faithfully, I believe will have the advantage. Both us and Panathinaikos have very experienced and accomplished coaches who know how to lead their teams at critical moments and make adjustments in the course of the series. The motivation that we all have is the same and is great. We feel like we haven’t reached the Final Four in the previous two years. The Final Four is being held in Turkey, we know that people are waiting for it, they want us there and the incentive is huge. The same is true for Panathinaikos, who are a great team with a distinguished history and are missing from the Final Four since 2012. We know they also want it badly and now they want to exploit the home court advantage, which plays a major part. I’m expecting a very difficult series, with intensity and passion, one in which everything will be decided in the details. Each player has a duty to fight with everything he’s got. It’s true that our opponents have been playing much better lately and have gained great momentum. The home court advantage gives them even more strength and energy. Panathinaikos are now very aggressive both in defense and in offense. They’ve all found their roles between them, Mr. Pascual knows the team as well as each of his players much better, while the return of James Gist – who gives them more athleticism – has also helped them. It’s going to be a great series! We lost the advantage and we have to get a game in the Olympic Sports Center and protect our home court. We know what we’re doing, we know how difficult our mission is against such a talented team with such a powerful home court, but we have the quality, the experience, and the determination to make it. Our minds are only on basketball, on the details, on what we have to do to achieve our goal. We’re going to give everything we’ve got and I hope the best team gets the qualification for the Final Four.